Sometimes Maharshi and his disciples sit up, especially after the night meal, reading Ribhu Gita, each by turn reading a verse. It is very easy to follow; and in places Maharshi puts in a word or two to make the meaning clear. The reading continues for about two hours at a stretch. “These readings,” he says, “from Ribhu Gita are as good as Samadhi.” Evidently such a continuous reading (following the meaning intently) induces Samadhi. 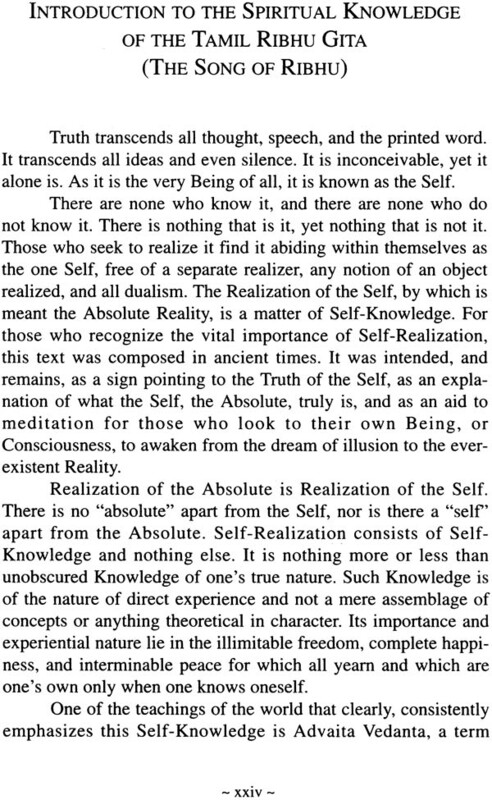 In fact, page after page, nay line after line, of Ribhu Gita merely goes on rubbing into one the Reality of the Self. With a constant study of such works the mind easily gets into the mood of Samadhi. The words keep ringing in the ears or within the heart for a long while and after as well. The Ribhu Gita as it appears in the Tamil language has been rendered in English in this book. The Tamil Ribhu Gita is a rendering in that language of chapters four through forty-seven of part VI of the Sivarahasya, which is an epic composed in the language of Sanskrit. The Ribhu Gita is an exposition of Advaita (Nonduality) by the Sage Ribhu to Nidagha and other sages and is set in the midst of the epic Sivarahasya. The appearance of Ribhu Gita in Sivarahasya was compared to the appearance of Bhagavad Gita set in the midst of the great epic Mahabharata by the late Pontiff of the Sankara Math of Kanchipuram in South India, Sri Chandrasekharendra Sarasvati. The Tamil rendering was performed by Bhiksu Sastrigal, also known as Ulaganatha Swamigal, of Tiruvidaimarudur, a village in Tamil Nadu in southern India. The work was published in South India more than a century ago, with subsequent editions until 1968. It is the 1930 edition that has been utilized for translation purposes of the present English book. The original Sanskrit text came to be published only in 1983 and was translated into English and published by the Society of Abidance in Truth in the USA in 1995, from whom it remains available. 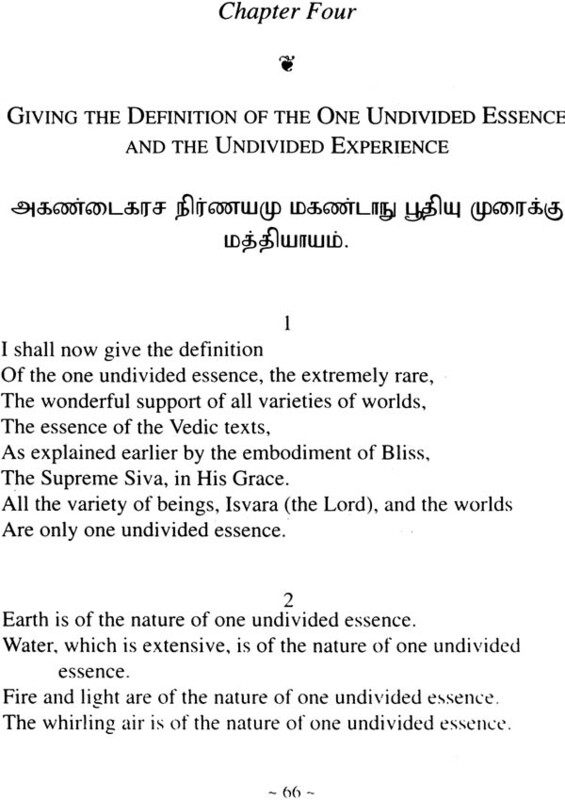 The Tamil rendering follows the Sanskrit original in its essential contents in chapter by chapter order. It was, though, rearranged by Bhiksu Sastrigal within each chapter and placed in eight-line verses in Tamil, with sonorous cadence and integral structure in each verse. This eight-line verse pattern is known in Tamil as “viruttam” verse. An attempt has been made in this complete English translation of the Tamil version to preserve the appearance of the original by retaining the eight-line verse pattern. Each stanza has been translated as a unit into English and placed in the form of blank verse of eight lines each, presenting theme-wise the individual lines also. The opening chapter of the Tamil Ribhu Gita contains a short introduction that summarizes the events leading to the exposition of Ribhu to the sages and others who had assembled in the Himalayas to listen to it. In the Sanskrit, this information appears in other parts of the Sivarahasya, and Bhiksu Sastrigal has included it in his first chapter for the benefit of the Tamil reader. The final verse of each chapter of the Tamil version differs dramatically from the final verse of early chapter of the Sanskrit version. While the Sanskrit verses refer to Siva, the Tamil version specifies Natarajli,' a specific form of Siva in dancing poses. Furthermore, .the Tamil version displays an evident focus on summarizing in the final verse of the chapter essential points pro- claimed in each chapter. The history of Ribhu is obscuJre: While the teachings contained in Ribhu Gita appear in thf ivarahasya, which, being an "Itihasa" or epic; must be assigned a date that is definitely post- Vedic, Ribhu himself, along with his disciple Nidagha, figure in several Upanisad-s, which are the Knowledge-oriented texts of the Veda-s. The teachings found therein are, in essence, of the same nature 'as those in the Ribhu Gita, so it can be hypothesized that these teachings, in whatever texts they may be recorded, date to Vedic times. This makes it possible t? say that Ribhu must have lived during very ancient times, but impossible to ascertain even an approximate date. Swamigal, or Bhiksu Sastrigal of Tiruvidaimarudur as he is also known, other than the fact that he resided in one of the southern- most states of India, Tamil Nadu, in the nineteenth century, was connected with the Kovilur Math, and was involved in translating Sanskrit texts into Tamil. He received spiritual instruction at the Vedanta Math at Kovilur, It is -evident that he was as learned in Sanskrit as he was eloquent in Tamil, and the brilliance of his rendition is only heightened by the humble absence of even a trace of personal references. The clarity of his rendition enables one to confidently conclude that he most certainly was one who deeply meditated upon and understood the meaning of Ribhu's teaching. In his introduction to the Sanskrit Ribhu Gita, the editor, V. Swaminatha Atreya, relates the words in 1969 of H. H. Sri Chandrasekharendra Sarasvati Swamigal Sankaracharya of Sri Kanchi Kamakoti Pitham (Conjeevaram, South India), who first spoke of the nature of the manner of exposition utilized by Ribhu and then said, “Another point you must note here is that this Ribhu Gita has attracted the attention of Tamil scholars. Sivarahasyam is just going to see the press in Devanagari script. A former attempt in Chettinad ended with the printing of the first and second Amsas. The whole text in Kannada script with Kannada translation has been published by Mysore Government Publication series, which is available at our Mutt library. You must compare that also in preparing the text for the press. This epic is quoted by many learned authors in support of their thesis some three hundred years ago. Yet it has not been so popular as Ramayana or Mahabharata. In such an obliviousness, if the Ribhu Gita has attracted attention of Tamil scholars, this does not only speak volumes of its authenticity, but also of the high esteem scholars have held for this work of antiquity. It was this very same Paramacharya (Sankaracharya) who directed the author and seeker Paul Brunton to Sri Ramana Maharshi. Brunton later published a book, A Search in Secret India, relating his search in India for profound, spiritual wisdom among the great varieties of spirituality, that culminates in his experiences with the Maharshi. The Maharshi, himself abiding in the very same state as Ribhu, gave instruction in the very same essential Nonduality (Advaita), the Knowledge of the Self, as Ribhu does in this Ribhu Gita. Sage Ribhu, who -is mentioned in the Purana-s as a mind- born son of Brahma, the Creator, is a figure in the Upanishad-s who speaks of the nondual Brahman, often in dialogues with the sage, Nidagha. He appears in several Upanishad-s, ‘such as the Tejobindu Upanishad of the’ Krishna Yajur Veda ‘(37th in the traditional -list), Mahopanishad of the Sama Veda (61st), Annapurnopanishad of Atharva Veda (70th) and Varahopanishad of Krishna Yajur ‘Veda (98th) in the traditional anthology of the 108 extant Upanishad-s. 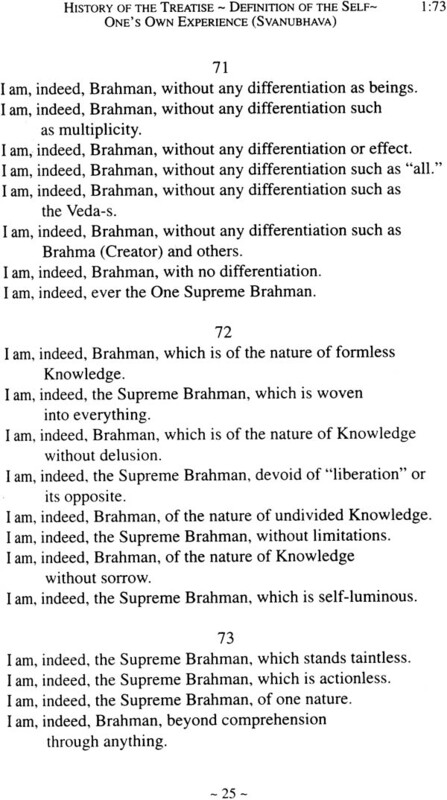 In these Upanishad-s, he describes the nondual Brahman—what it is and, very often, what it -is not. The teachings of Ribhu, which the texts proclaim he learned by receiving them directly from Lord Siva, have been paraphrased and elaborately set out in Part VI (Sixth Amsa) of the voluminous twelve-part Sanskrit epic Sivarahasyam. In this part of the tome, the bestowing of the teachings is set in a scene on the slopes of Mount’ Kedara in the Himalayas in which there is a dialogue between the sage Ribhu and sage Nidagha, who heads a host of rishi-s (sages). 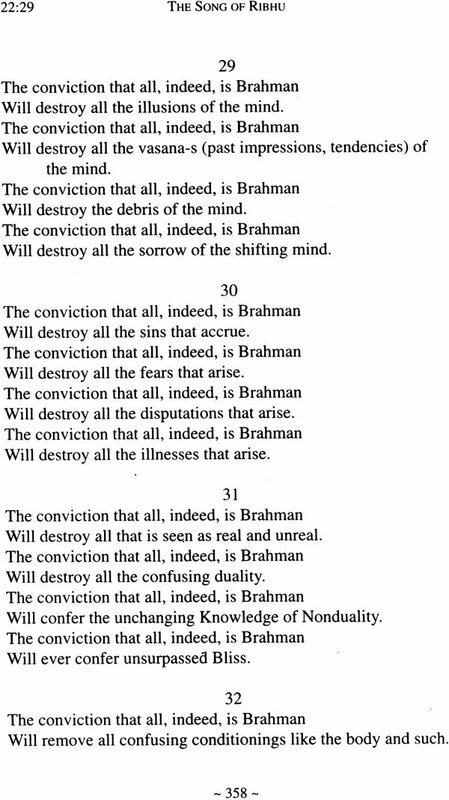 This dialogue was translated into the Tamil language over one hundred years ago by Brahmasri Bhikshu Sastrigal, who was also known as Ulaganatha Swamigal in his renunciate life, of Tiruvidaimarudur in South India. This Tamil translation is simple in style, being in the form of the Tamil viruttam verse, consisting of an octet of lines, and extends through 44 chapters into 1,924 verses. The verses cascade in sonorous cadence ideal for recitation, capturing the contents of the original Sanskrit of the Sivarahasyam chapter wise while the verses are thoughtfully arranged to bring out the sequence of the Knowledge expounded. While the Ribhu-Nidagha dialogue is a part of the continuing epic, Sivarahasyam, in Sanskrit, the Ribhu Gita’in Tamil is an excerpt from the Sivarahasyam, and, for the benefit of the readers, the author has prefaced the work in Tamil with a brief introduction on the context leading to Ribhu’s discourse on Mount Kedara after the customary invocatory prayers to the concerned gods and goddesses required by literary tradition. Thereafter commences the nondual teaching by Sage Ribhu. 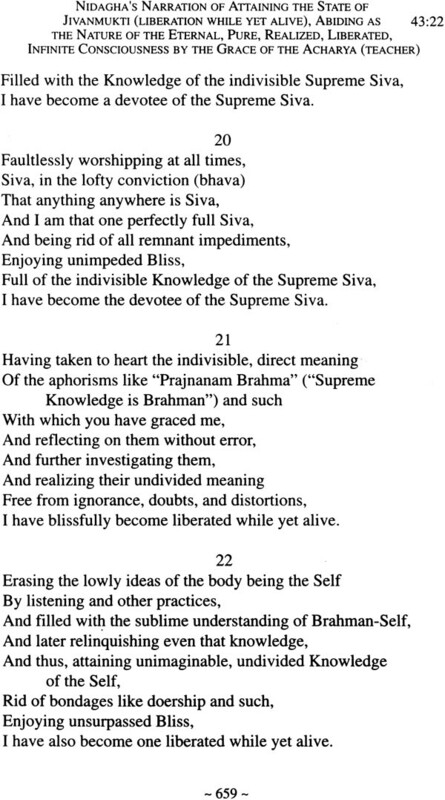 The original Sankrit text concludes each chapter with a stanza in praise of Siva, which apparently is not a sequel to the nondual teaching on Brahman by Ribhu. The Tamil rendering follows closely this closing format for each chapter by means of a verse in praise of Nataraja, the Lord of the Dance, which, though, is a succinct summarization of the teaching in the chapter, stating that it is Lord Nataraja who explains the teaching in the chapter. Besides the Sanskrit and Tamil versions of this text, there are publications of the Ribhu Gita in the Kannada and Bengali languages. Recently, in 1996, Sri Ramanasramam of Tiruvannamalai, South India, brought out a reprint of the Tamil text, supplying their own introduction. This present translation into English has derived significant help obtained by consultation of the printed Tamil publication of the Ribhu Gita by the Kovilur Math, brought forth over a century ago, which is thankfully acknowledged. The text of the versified Tamil Ribhu Gita is a relentless reiteration of uncompromising Advaita (Nonduality)—that the Supreme Brahman, “That,” is all that exists and does not exist, that nothing else exists, that the Self is Brahman and Brahman is the Self. The consistent message is that I am That, I am all, and That is myself. This Awareness is Moksha (Liberation), which is attained by the way of Knowledge and the certitude that I am Brahman. 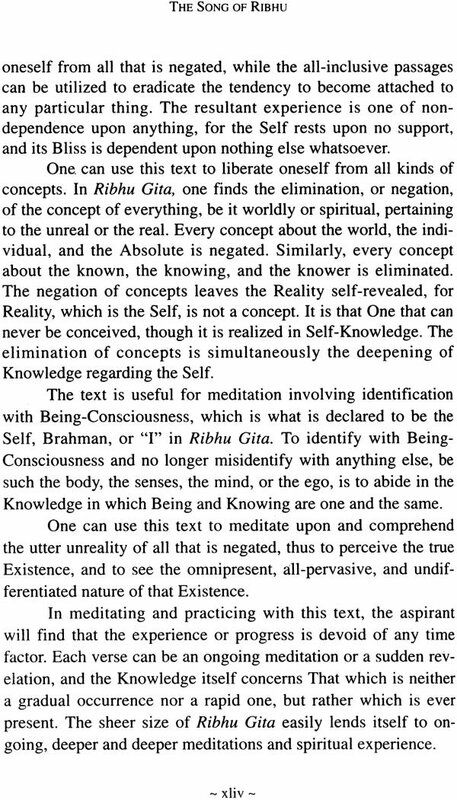 Brahman-Realization by a knowledge of negation is reinforced by a profusion of instances of what “That” is not. That Brahman is all is emphasized by the expression of a plenitude of positive examples. Translation is inherently approximate, however diligent the attempt may be. In general, each stanza of the original text in Tamil has been rendered as a unit. The contextual connotation in the idiom of the original Tamil language may not be precisely or approximately reflected in the new language in a translation that gives only the direct meanings of individual textual passages and translated words. Consequently, the approach of the present translation team has been to adopt word-by-word, phrase-by-phrase, or sentence-by-sentence translation, or even restatement of the themes in the new language as best serves the endeavor to convey the true meaning and actual contents of the original as closely as possible. 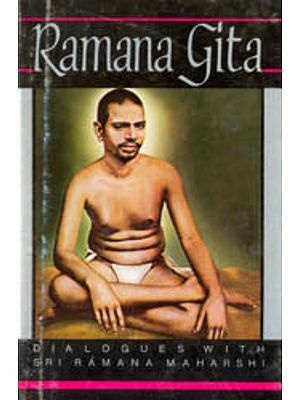 This present full translation of the Tamil Ribhu Gita in the English language is a humble attempt to make available these teachings of highest Wisdom and to spread them to all those everywhere in the English-reading world who have felt the yearning to study, explore, understand, mediate upon, and realize these essential teachings of pure Nondual Knowledge so many times referenced by Sri Ramana Maharshi and other sages. May this present publication serve to help fulfill that sincere yearning for Truth. It is the Lord of Dance, Nataraja, who proclaims all that is found here.